As we know from God’s Word, God’s instructions in marriage are for the husband to be the provider and protector of the family and the wife is to be his help meet and keeper at home. This is the way God created marriage to be and is His perfect will for us. “Instead of being a hindrance to her husband’s advancement, she furthers it. Her influence for good to him also. Having no domestic anxieties, he is set free to do his part in public life” (Ellicot’s Commentary). Unfortunately, many women demand that their husbands help around the home, even after the husbands have worked hard all day at work. A godly wife will do all she can to make sure that all of her home duties are taken care of and the children are well disciplined and trained so that when her husband comes home from work, he can relax and enjoy his time with his family. “Known; observed and respected, not only for his own worth, but for his wife’s sake; not only for those rich ornaments which by her care and diligence she provides for him, which others of his brethren, by reason of their wives’ sloth or luxury, are not able to procure, but also for his wisdom in choosing, and his happiness in enjoying, so excellent a wife, by whose prudent care, in the management of his domestic concerns, he hath perfect freedom wholly to attend upon public affairs…Sitteth among the elders of the land, in counsel or judgment” (Matthew Poole’s). Her husband’s career is as a leader and/or judge in the land. He is able to do his job well because he has no concerns or anxieties coming from his marriage or home life. He chose a godly, submissive help meet who takes pleasure in working hard in the home and with her children. He trusts her to take care of all her work in the home so he can take care of providing for his family. They each know their role and work at it to the best of their ability. We know couples where the wives are slothful in the home. They don’t care for their home, nor do they discipline and train their children well. Their husbands don’t come home to a delicious smelling dinner, nor do they come home to a clean home or well-trained children. In the morning before work, their work clothes sit wet in the washing machine. Their wives bring them dishonor and shame. Let this never be said of any of you. 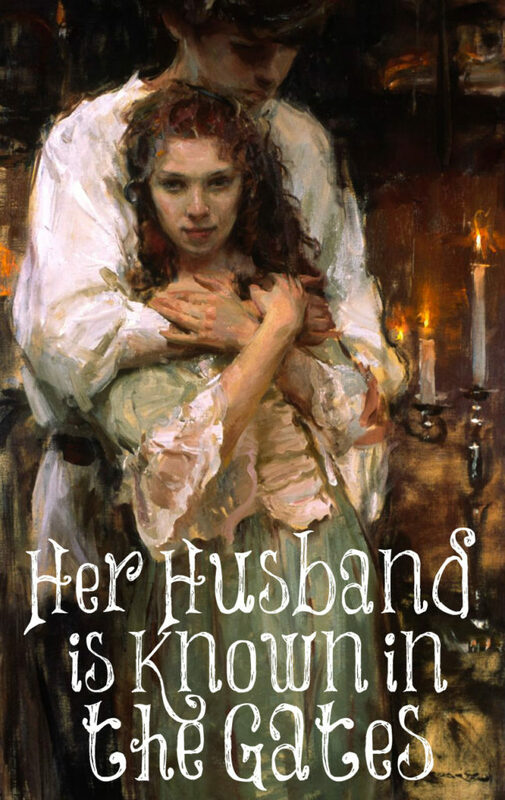 “Her husband is known in the gates,…. Of the city, where courts of justice were kept, and causes heard and tried by the judges, the elders of the land, later mentioned; among whom the husband of the virtuous woman was, where he was known, taken notice of, and celebrated; not so much for the beautiful garments she made him, as Jarchi; but rather for his wisdom, as Gersom, and for being the husband of such a woman; who, taking such care of his domestic affairs, he was more at leisure to attend public business, and transact it with reputation…when he sitteth among the elders of the land; when he sits in his house, at his table, circled by his saints, his ancient ones; or as King, head” (Gill’s Exposition). Everyone admires this man for the wisdom and confidence that he shows in his work. His wife is definitely his crown. She has built him up and encouraged him, thus she has made him look good to all those around. She is his biggest cheerleader and confidant. He knows he can put all of his energy into his work because he can come home and enjoy the fruit of his wife’s labor. He is a blessed man indeed. “Such a woman advances her husband’s interests, increases his influence, and, by attending to his domestic concerns, enables him to take his share in public matters, so that his name is in great repute in the popular assemblies at the city gates” (Pulpit Commentary). May you all be this kind of wife who builds her husband up by respecting, reverencing, submitting to, and loving him. May you treat him with kindness and gentleness. May you work hard in your home and make it a place of order and beauty. May you raise your children in the nurture and the admonition of the Lord so that your husband can be thankful that he was blessed with such an incredible help meet; the perfect one for him. What is a Feminine Woman? Wonderful article, thank you Lori! It is so good to know the plans and purposes God has for us as Godly wives. My greatest fulfillment as a woman stems from being a helpmeet to my husband. My ministry of serving him has been motivated by wanting to see him succeed in the workplace. Thanks for this excellent post. Yesterday’s post was also outstanding; I plan to share that with my daughters. Thanks, Lori. Much good truth here. Just want to be sure you’re not saying it’s solely the wife’s job to train the children. The charge is specifically to fathers in Ephesians 6. Of course in all things the wives help the husband. Just not solely. The wife has some input, but ultimately she makes sure the husbands desires for how the children are raised are carried out. If the husband is at work, the mother is the one at home making sure everything is meeting her husbands directives. Good explanation. Thank you. Yes, the mother is the one who is home all day with the children so the majority of the disciplining and training does fall upon the mother so it’s imperative that men marry godly wives. These Proverbs 31 posts are the best I’ve ever read – and I’ve read many ‘explanations’ of these verses over the years! It is with deep gratitude that I continually learn and am inspired by your writings. You’re welcome, Linda, and thank you for your kind and encouraging words. They have been fun to research and write about. They sure have convicted and challenged me! Good article! I am a stay at home homeschooling mom of 5. My husband is the breadwinner as I am the homemaker. I have the house clean and dinner ready by the time he gets home. I LOVE my duties as a Godly stay at home wife, and absolutely adore my husband as well as serving him…BUT, I do not see harm in husbands helping their wives when they get home from work and on weekends (whether it be with putting the children to bed, changing diapers, helping with kitchen clean up, etc.) In fact, I’ve watched my eldest son (who’s married with 2 children) show his wife love and respect by helping her, as listed above, when he gets home from working 14hr days (my son learned this by watching how his father treats me😊) His wife is a Godly servant to him, but he enjoys showing his love for her by helping her with housework. This reminds me of how Christ treats his church with love, tenderness and devotion. I’ve just started reading your commentaries, so you may have already said something similar. Thank you for your postings. They are very thought provoking. Unfortunately society doesn’t look at a man’s wife the way the Bible speaks so highly about. In the Bible men are admired by the woman he has at home but in today’s time he is admired by the woman he has at work. I am a wife devoted to being a keeper at home and he is known as the husband who has a wife who “doesn’t work” but in a derogatory since. People don’t understand why he doesn’t have his woman help bring in income, including his parents. What im trying to say is that it’s hard to apply all of proberbs 31 to us because we are now going against culture and the proverbs 31 woman didn’t have that problem. But God doesn’t want us to follow culture he wants us to follow Him and that’s what I plan to keep doing! I had feel the same way for many years, but in the last few years, as we are older my husband and I, some of my husband’s colleagues expressed their envy about my husband being free off home-related worries, having his wife by his side when times are tough or simply when he wishes, having a nice lunch prepared for him, having his wife at home with his kids, etc… These are things men appreciate and I guess they appreciate it more as the years pass by… I’m so delighted to be the wife my husband needs 😁!